Her name is Luann L. and shes a carboholic. But the 39-year-old Illinois woman isnt ashamed to admit that carb addiction led to a roller coaster of highs and lows. 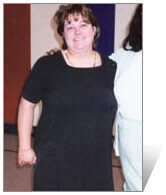 Luanns weight skyrocketed to 211 pounds, while her self-image took a major plunge. Desperate for a slimming solution, she turned to a low-fat diet and plenty of exercise, walking up to three miles a day. Yet the extra pounds continued to pile on despite her efforts. The more low-fat I did, the bigger I got. I was eating baked potatoes with no-fat butter and no-fat sour cream and pasta with no meat sauce. But I kept getting bigger, she tells eDiets. Luann rushed out to get her copy of Dr. Atkins' New Diet Revolution (Avon Books). By the end of the first paragraph of the low-carb bible, Luanne knew she had been saved from a lifetime of battling the bulge. She finally realized shed been looking for loss in all the wrong places. Forget low-fat; it was a low-carb eating regimen that was going to put her weight woes to rest for once and for all. And she was right. In just seven months, she shed an incredible 60 pounds from her 54" figure. Four moths later she had dropped another 11 pounds. Today, shes holding steady at 140 pounds, feeling better than shes felt since her early 20s. At first, Luann had her doubts. A self-professed carb lover, she didnt know if she was prepared to part ways with pasta, potatoes, breads and other favorite foods. But Luanne cast her concerns aside and got with the program, which proved to be love at first bite. I got to eat so many great-tasting foods, and as much as I wanted, whenever I got hungry, says the public service administrator. I always felt like I was starving on a low-fat diet, watching the calorie and fat content. On Atkins, I could eat any time I wanted. In the beginning, I counted the calories and carbs strictly. But once I got used to this way of eating, I knew what I could and couldnt have. I didnt have to count carbs anymore. It wasnt just the scrumptious meals that gave Luann instant gratification -- she lost 15 pounds in the first three weeks. From there, she lost three to four pounds a week just by giving up those costly carbs, which Luann describes as more filling than flavorful. without the spaghetti. Instead of potatoes, she would serve stuffed mushrooms or green bean casserole. There was a whole new realm of low-carb, high-flavor recipes out there. What made the Atkins approach even more appetizing was that she could follow the plan wherever she ate. Every meal was like a special occasion. I could go anywhere and eat, even fast food restaurants. Id order a cheeseburger and take the bun off. Id go to dinner and have steak and mushrooms. I could even get my chocolate fix with sugar-free puddings. I didnt feel deprived. I didnt feel like I was excluded. And I didnt have to count everything I put in my mouth. All I had to know was if it was a protein or a carb, she explains. Once Luann had reached her weight loss goal, she was in the Lifetime Maintenance phase. That meant she could start introducing carbs back into her diet. Although Luann has a sandwich here and there or a pasta dish once a month, she is quick to point out that the carbs take their toll on her energy level. Luann admits shes found the best thing since sliced bread -- low-carb bread. She can now enjoy the Reuben sandwiches she loves without feeling the carb effects after the fact. It wasnt just the great food that Luann loved about the Atkins approach; it was the remarkable results you achieved. Within a matter of weeks, Luann says everybody and their dog started asking her how she was losing. In fact, she got so many inquiries that she made a sheet on the Atkins approach and handed them out to people who asked. Luanne estimates about 10 of her co-workers have jumped on the Atkins plan since seeing her results. The days of fighting the fat are over for Luann. Shes lean and loving it. Since dropping 71 pounds, she now works out religiously with her fiancé Dan, a fitness fanatic. Shes gone from squeezing into a size 18 to feeling comfortable in a size 8. But it wasnt dieting that changed her life; it was changing her diet that gave her a new lease on life. You can now have your own personalized Atkins plan at eDiets, making this effective program even easier. From recipes to shopping lists, you'll receive everything you need at this one stop shop.